This store was built in 1866 and boasted steel fire shutters. Sadly, in 1939 while in use as a warehouse, it burned down. Silver City is composed primarily of wooden structures, some of which date to the 1860s. 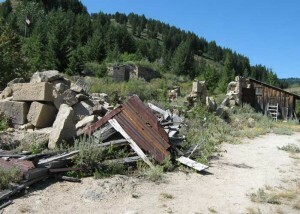 The few stone buildings in town did not fare as well. The county courthouse was built of stone and also dated to the 1860s but was sold and torn down for salvage in the 1940s, a fact that still irks town residents.